... or at least something in the same style. Don't worry about copying every line in my image if you don't want to. It's the work flow and general ideas that is being taught in this tutorial. This is a completely "sketch-free" image, so if you feel you're having trouble with sketching on the computer, this should be good news (we will instead sort of "sculpt" our city) . Making an image like this allows for a surprisingly low level of precision. 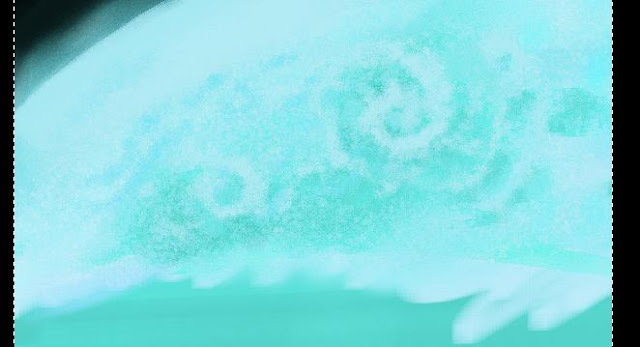 This means that you can do this with a mouse as well as a graphics tablet, all it takes is that you don't rush your brush strokes too much and takes your time. Regardless of which tool you use, I can guarantee you that if you follow the "house-designing" steps (which are among the first steps) in this tutorial carefully, your hand-to-eye coordination and skill will increase dramatically. So even if you don't complete the entire image, the first steps in the tutorial are very useful also as a general freehand-drawing exercise. If that's what you're looking for, jump forward to the section called "Designing sci-fi houses from basic shapes". If you like this tutorial, feel free to drop by my deviant-art account at http://griatch-art.deviantart.com/, it's always nice with some comments there too, not only here on GIMPtalk. This tutorial will make heavy use of the airbrush, paintbrush and eraser tools. You must also be familiar with layers, selections and filters. Thus it's a sort of continuation of my previous brush-technique tutorials. I recommend you take a look at my [Setting up GIMP for artistic work / Basic airbrushing tutorial] to get to grips with the airbrush tool. I will also assume you have used that tutorial to set up the small set of "adjustable brushes", because we will use them in this tutorial. Not as important for this tutorial is the [Advanced Airbrushing tutorial]. That is mostly interesting for training use of the smooth tool, but we won't use as advanced things in this image. Still the smudging techniques are always good to know. Finally, the eraser and the paintbrush are treated in my [Penciling tutorial]. Once again, we won't do any sketching in this image, so that tutorial is mostly useful for its discussion about the eraser tool and how you use it. Also, learn the common keyboard shortcuts! At least learn the keys for airbrush (a), smudge (s), eraser (Shift + D) and paintbrush (p). Also learn the critical skill of picking colours off the canvas. This is done by holding down the Ctrl key and clicking on the colour you want (remember that you only pick colours in your current active layers though). You do not want to move your cursor over to the toolbox any more than you have to. Unlike in other of my tutorials, we won't make much use of the opacity of the airbrush in this tutorial. You can for the most part work with an opacity set to 100% for both the airbrush and the paintbrush unless suggested otherwise. If this feels too "direct" for you, lower the opacity as you wish. You might consider setting the eraser to around 70% opacity or less. Play around with this until you find a setting you like and if you find a step hard, try changing the opacity setting and try again. For this picture I used the version 2.3.14 of GIMP running on Linux Debian, so the windows might not look exactly the same if you are on another OS or have a later version. But you should be able to follow this tutorial no problem with any version of GIMP. 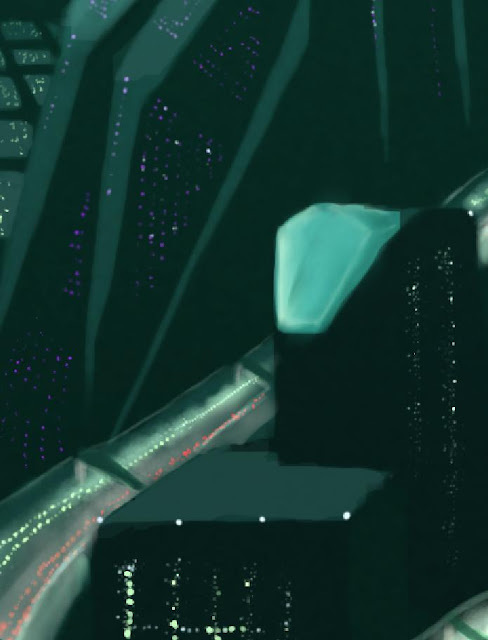 (Ignore the multitude of layers in the image above, we'll gradually create these as we go along). Begin by creating a new image of size A4 at 300DPI (2480 x 3508 pixels for you Americans). Create a new layer named "Colour wash"
Zoom out so you see the entire image. Keep working at this large zoom-out until further notice. Take your resizable round brush (you did follow the airbrushing tutorial and set that up, right?) and make it as large as you can without making it dreadfully slow. 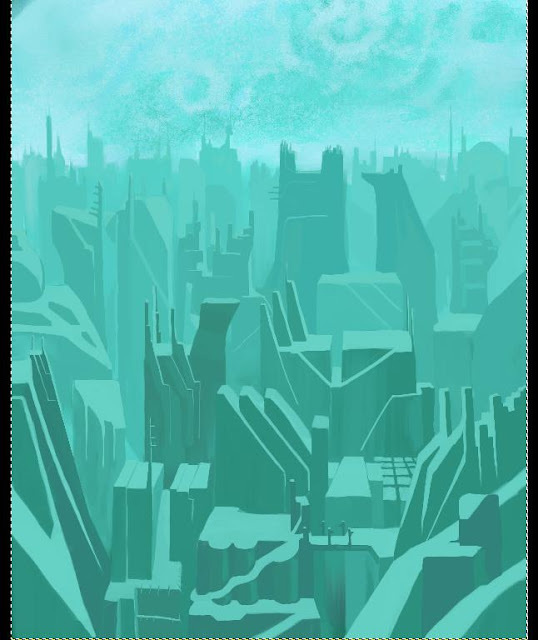 Pick your airbrush (press 'a' key by default) at 30% opacity and sweep out splotches of turquose, green and purple over the image. Keep it light towards the top -- this is going to be the sky colour and a bit darker towards the bottom. Put in some other colours there too, just for good measure. 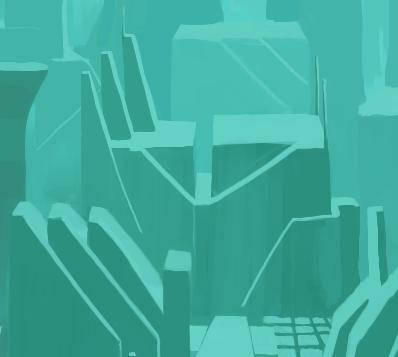 It's not extremely critical how this layer looks, but it's good to have at least a stable background so no white canvas shines through. Now choose the smudge tool and swoosh around so you smudge the colours into a smooth mix. If you want you can run the blur filter too, but that's not really necessary. Just make something roughly like what I have above. Establish at least a weak line for the horizon. 1/3 of the height down from the top is a good start (close to the "golden cut" ratio). Since this is to be a sci-fi image, I decided to have the Earth (or some other bluish planet) show in the sky. Create a new layer set to "normal" mode. Name it "Earth", just to pick something. Make a base of bright turquose and sketch out a wide sphere. Put some black up in the corner to show that there's space out there. Use the airbrush to put some slight dark here and there to give a hint of land. Blur with the smooth tool. 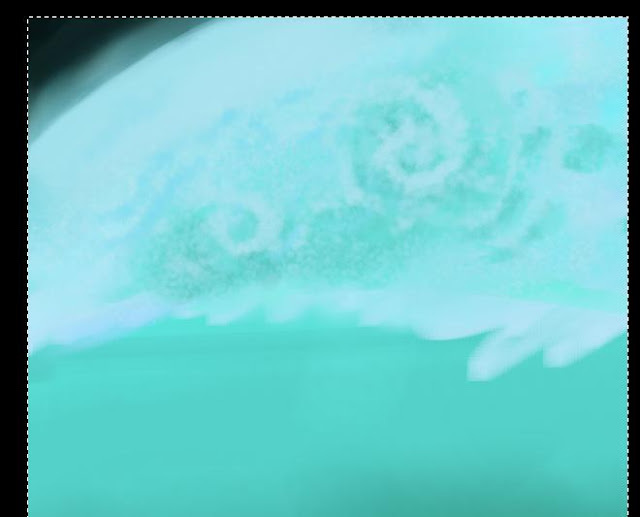 Take the paintbrush at a low opacity and blob around some "clouds" over the whole thing. Planetary atmospheres have vortexes in them, mark out a few of them, but don't make it too sharp or clear. Smudge it if it's looking too sharp. As you see, you don't have to be too detailed here. Make a duplicate of the Earth image and name it "Earth - glow layer ". The idea is that the soon-to-be-drawn city will rest below some sort of transparent dome. Run Filter->Enhance->Sharpen and sharpen the image with a setting close to the maximum value. Set the layer to overlay and its opacity to about 40%. You should now have a rougher view of the Earth. It's not looking like much right now (and in this jpg image it's not coming across very well), but it'll be fine later. This section also constitutes a stand-alone freehand drawing exercise. 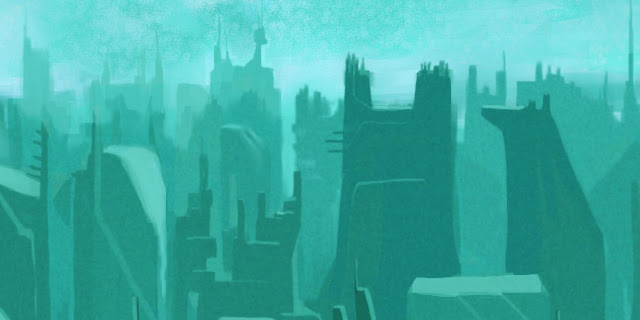 Following the steps in here to design an entire city will help your skills a lot. 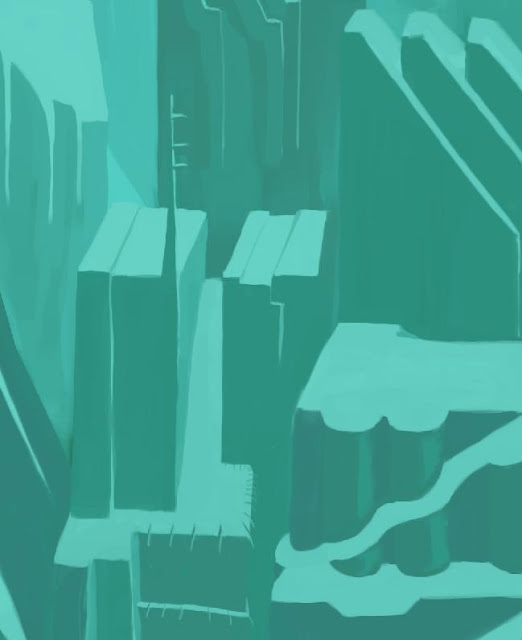 Create a new, normal layer named "City structure". Pick the Paintbrush (shortcut 'p') and set it to 100% opacity. Also prepare the eraser with 100% opacity. Now it's time to zoom in. Pick a zoom area fitting the building. Pick the square adjustable brush you created in the Basic airbrushing tutorial. Now choose three matching colours from the palette. The brightest one should be the same colour as the sky and the others should be in the same palette. Pick the ones I did if you're unsure. From now on, only stick to these three colours. Don't pick them over and over from the palette, but re-choose them by picking them from the painting with the Ctrl + click feature. 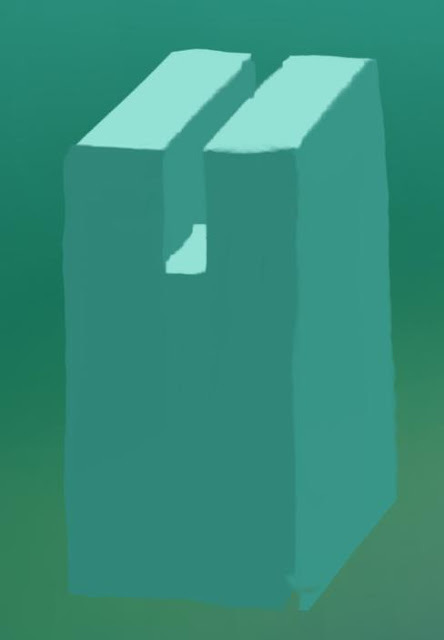 Using the square brush, block out the areas of a long box. Do everything on one layer from now on. Be careful to get perspective right already at this stage. 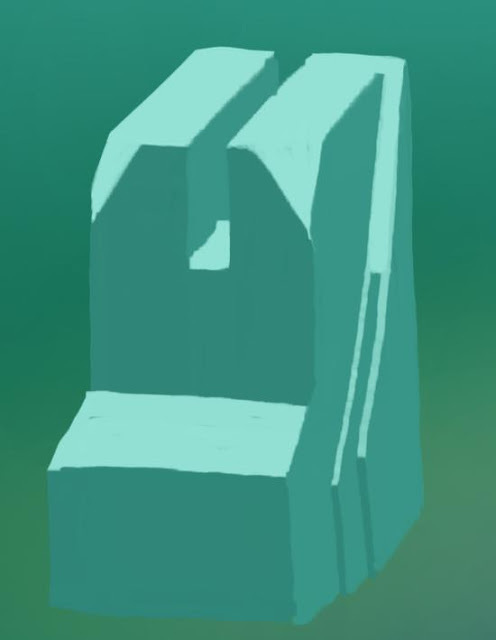 All buildings in this image will start with a box like this. When you're getting the hang of it you can start the box lying down or being more narrow etc. 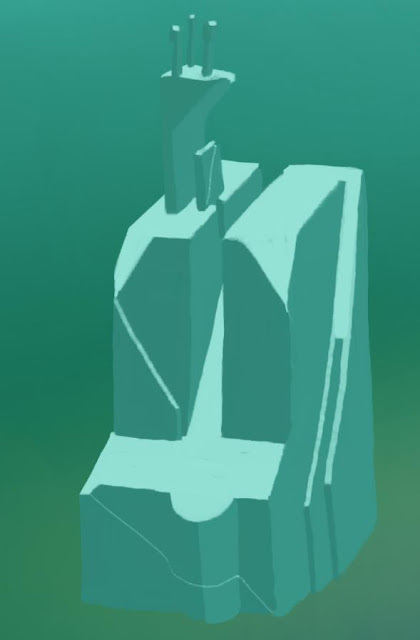 In the following images I will show how to "sculpt" this simple form into a futuristic building. When you plan out the entire city, you might want to actually fill it up with these simple boxes from the start, so you get perspective right. Since they are so simple you can easily make many of them right off. Try to vary their heights and widths, but keep them as simple boxes for now. The closeness to other buildings will help your inspiration -- for example you might find that two buildings actually looks better as one merged building. 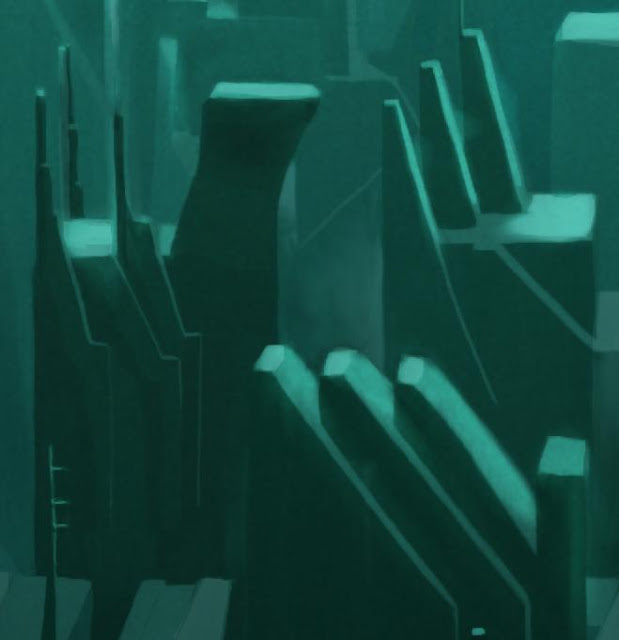 It was pointed out to me that creating the perspective for the entire city is not very clearly described above. So here's a more elaborate explanation of how to compose it. The "vanishing point" (the point far away where everything blends into one point) is of course critical in a picture such as this. I did the perspective directly "by eye" in this picture, all I really marked with a "guide line" was the horizon. But this doesn't always work out so well if the perspective is complex, and then there are several useful hints you can keep in mind. First of all, I emphasize that you should not create the buildings separately from each other without zooming out. That's a sure way of messing up the perspective. As said, you should do the first step (the rough box) of all the houses first so that the perspective is roughly right, THEN you go down to details, and maybe blending houses together etc. But sometimes even this box-making can be tough to get right. So a good idea for making the initial "depth" perspective right is to begin with laying out only the top surfaces (that is, only the brightest colour) of the houses/boxes. This way you can use very simplistic perspective to plan the scene. Create a temporary layer above your "City Structure" layer. Pick the paintbrush tool, some colour and mark a point on the horizon as the vanishing point. Then you pull out straight lines from this point out to the edges of the image (Shift + click/drag makes straight lines). These perspective lines are standard tools for perspective drawing and will help you a lot. Later you can just delete that layer. Maybe using your grid layer to help you, you should now put down the top surfaces of the houses, vanishing into the distance. You should end up with a "grid" of bright-colour squares getting smaller and thinner the further they are, all flat-looking and dull. Now that you have that basic perspective right, go break up the grid by erasing some of the squares and turning the others into complete boxes (using the other two colours you've chosen). 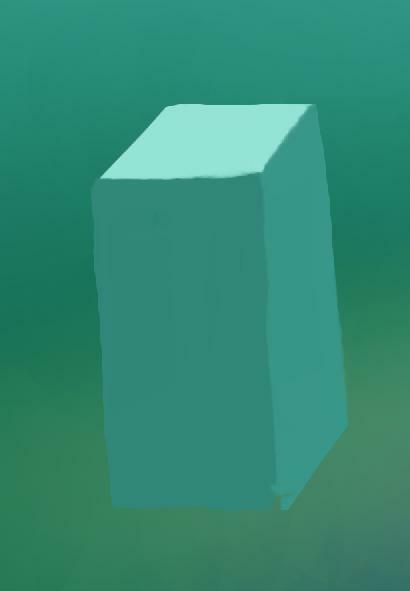 Make some boxes taller to block those behind them and others shorter, but remember that perspective will change for the top surfaces as you change the height -- but when you already have the "depth" in place it shouldn't be too hard to see how it should be. Don't bother about making anything too detailed yet, like making two houses into two and so on, save that for the detailed work, For now you're just worried about rough perspective. Once you have that mass of houses very roughly planned out, continue with the tutorial below, working on the separate houses. Use the eraser to sharpen the edges of the box. Use the paintbrush to straighten lines inside the box area. Observe how only three colours are used all the time. The square brush allows you to keep the corners sharp. I straightened the box a little by rotating it with the rotate tool (it was leaning a bit before) and also made an inset into the block. At this point it's only about having a feeling for the 3D-form. You goal now is to sculpt the box into a more interesting form. Imagine you're carving away at a wooden block and try to imaging how the edges would look. Strictly sticking to the three colours will help a lot. This will be a true monster of a building, a huge monolith worthy of a sci-fi landscape. 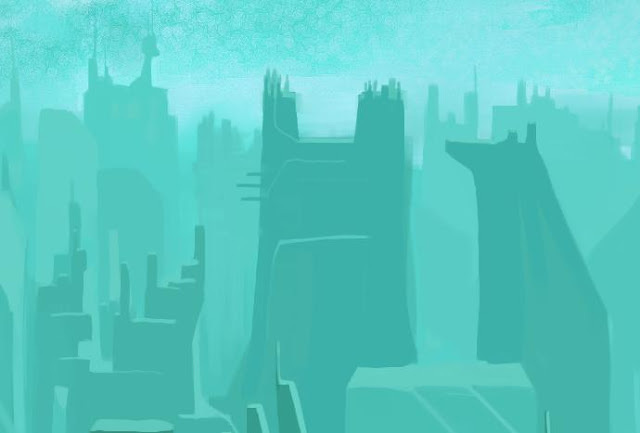 Here I've beveled away the edges and added some more structure to this futuristic building. Remember at all times to envision how this would look if you could turn it around like a carved wooden block. Here I've attached two new boxes on top of the old one. I also made the central cut into a long slope. The level of complexity here is really only limited by your imagination. But notice that There is not "texture" to the building, such things would have to be added later. The sides are only made up of one colour. I'm imagining this to be a very large building, so those new boxes are infact skyscrapers in their own right. Adding and expanding on the previous design in order to add some curves. Curves are more difficult to draw in perspective, but it's a useful exercise. I also added a sort of "control tower" to this strange-looking building. Right, back to the main image. This is a similar building integrated with several others. I've also added some more details on the ledges of this, I plan to put lights on it later. In this image I've actually added some more colour than the three basic ones, but ignore that for now. Work with your three colours and build your shapes as complex as you want. It's really fun once you get the hang of it! It's important to be creative and don't repeat yourself too much. Even though a real city don't have much diversity to buildings (they are usually just boxes), we need to give something for the viewer to look at, something to do with their eyes. Here you see two boxes that I decided to meld together into one , complete with ledges and some sort of structure on the roof. If your city is starting to shape up at this point, you can subtly start to change the colours used for the vertical sides so you can separate overlapping buildings. 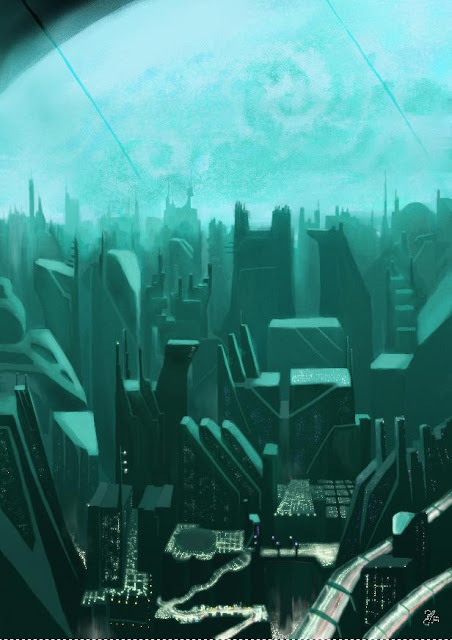 The buildings further off should be slightly lighter than the foreground , since you look through more atmosphere to see them. Just remember to always keep the "top surface" colour the same. Don't change that or you'll loose consistency in the image. Once you're starting to move really far off in the image you abandon the the boxes and start drawing outlines instead. 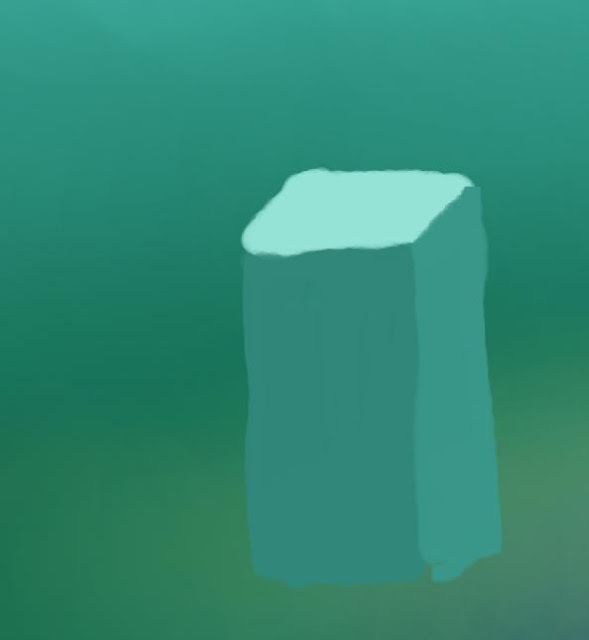 Work with the square brush and the airbrush at 50% opacity. The important bit here is to keep the colours bland and very close to the colour of the sky. Drawing silhouettes are much easier than drawing boxes, so you can go more wild with details right away. Be careful though, if the distant buildings show plenty of detail, the foreground should ideally show even more detail ...! Also distant buildings can have a 3D-feeling to them. If you look at the center building you'll see that some of the "towers" are duplicated with a lighter colour. This gives the feeling of the roof having depth. Eventually you will have designed the main structure of the city. Good job! This is the main workload of this image. As you can see I've experimented with some bridges here and there too, and also added some more detail closest to us. At this point we're done with most of the work, namely the design of the city structures. From now on we will use this hard work as a base to create a finished final image. 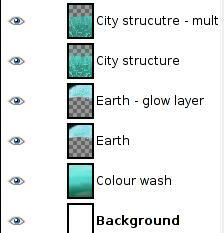 [Make a duplicate of your City structure layer. Name it well and put its mode to "Multiply". Now we add atmosphere to the image. On your duplicate city structure layer, choose Filter->Noise->Scatter HSV. Run it with default settings. This will add grain and realism to the image, simulating the effect of a rather warm atmosphere distorting your view. The "multiply mode will make the effect more subtle. Lower the layer opacity to about 70% to make the grains less sharp. Next, mask out the sky. Do this either way you want, I did it lo-tech with the lasso tool and a high feathering. This has the advantage of being able to use the smudge tool very creatively later. 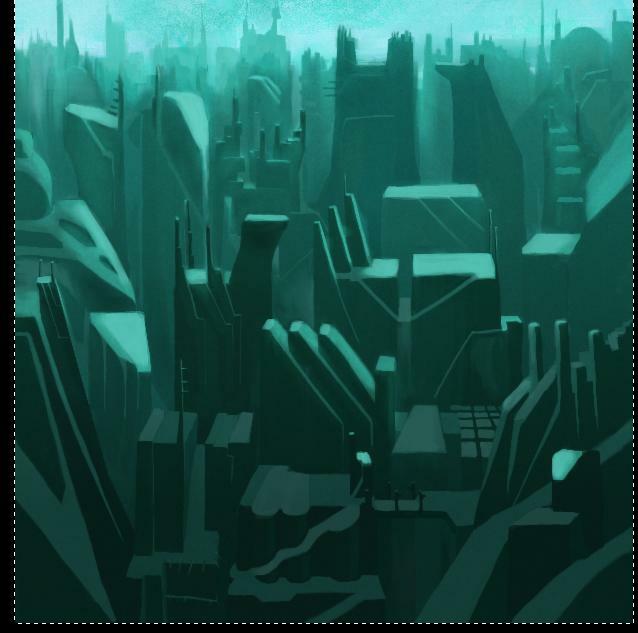 Make sure all of the city (that is, everything below the skyline) is within the selection. Save this to a path so you have it for the future. 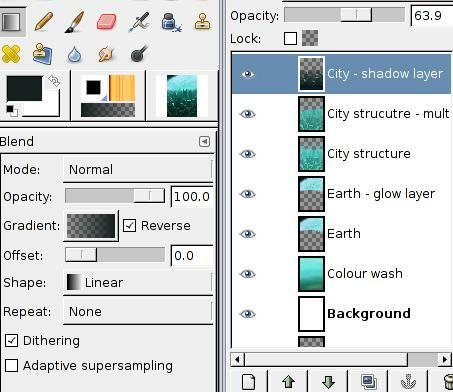 Create a new layer, the "City - shadow layer". Set its mode to "burn" and an opacity of 60% or so. Now choose the gradient fill tool and choose the "Transparent -> FG" gradient (it's a standard gradient.) 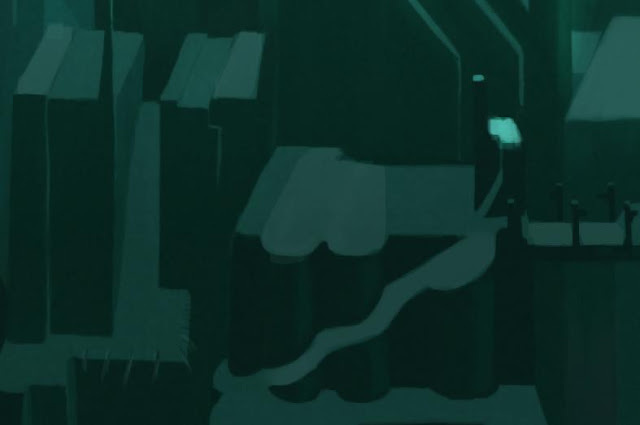 You want to fill in the selection you just made so that it's transparent near the top and darkest towards the bottom (that is, the buildings closest to us will be darkest). Pick a very dark blue and fill the layer linearly in the vertical direction. This image is of the part of the city closest to us, in the center of the image, now darkened by our gradient. We have added shadow, now to make something interesting with it. This is where the eraser tool comes into its own. Use it with the square brush and strategically erase parts of the "City - shadow layer" so the bright underlying surfaces appear. In this image I have assumed the entire section is actually in shadow, leaving only the highest rooftops lit by the Earthshine. Erasing in the shadow layer with a low opacity to the eraser can help enhance different surfaces differently. Don't bring forth all the bright surfaces you had from the beginning. If all you wanted was to make the darks darker, there would have been an easier way to do that. Rather use the eraser to "sculpt the light". All the colour is already there, all you have to do is bring out selected bits. If you used the feathered lasso tool to mask out the city earlier, some darks will have spilled over into the sky. select the entire image if you haven't already and select the smooth tool (with an high opacity). With the smooth tool and square brush, drag this dark overshoot straight down into the skyline. 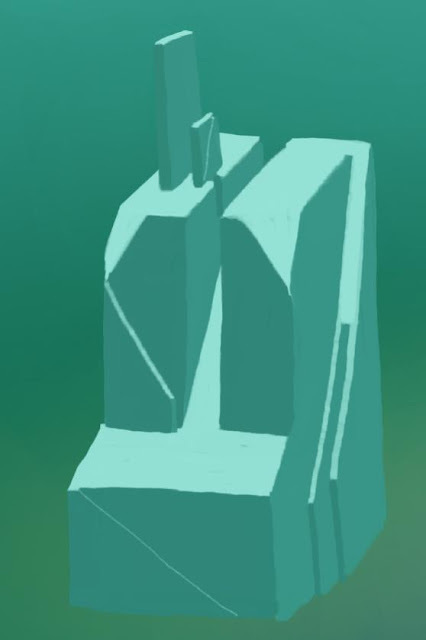 You will find that this makes it very simple to add further structure to the skyline. All cities much have street lights! 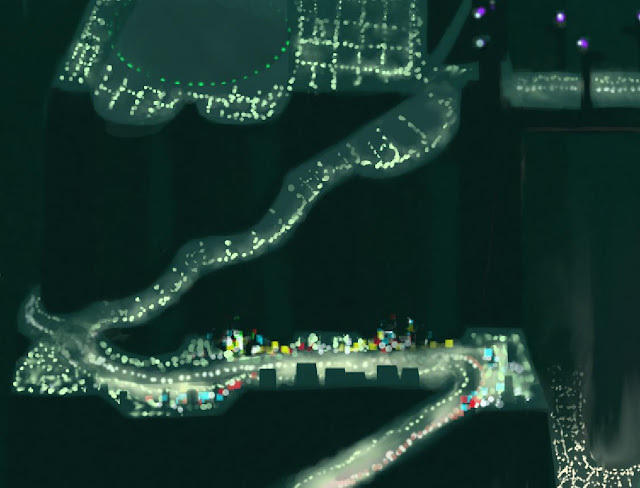 Create a new normal-mode layer named "City lights". 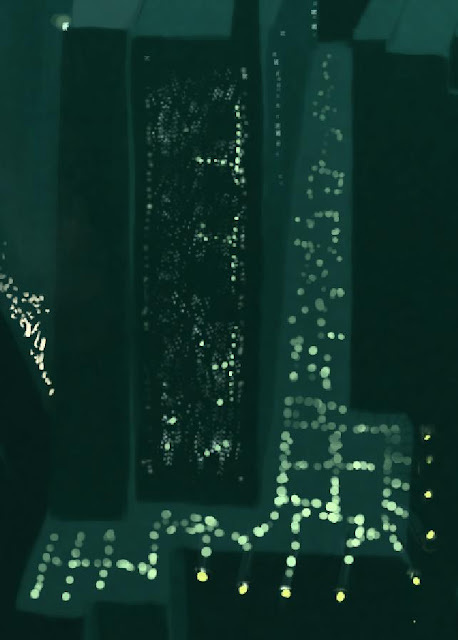 Use the paintbrush at 60% opacity to dot down lights and structures. Here I've created a commercial street by adding different coloured squares. The overall "light haze" is applied with the airbrush at very low opacity, like 20%. These buildings are so big that you don't see individual windows, rather it's enough to just put down a sort of blur of windows. If you create a small brush consisting of small dots and apply that with a long spacing, this will speed you work. Try to vary both size and intensity and go over it with the eraser now and then to make it look more random. Here I've also added a highway, with cars traveling in both directions. I put that highway in a transparent tunnel, just for fun. Another example of light structures. Don't forget to dim the lights as they descend into the distance. 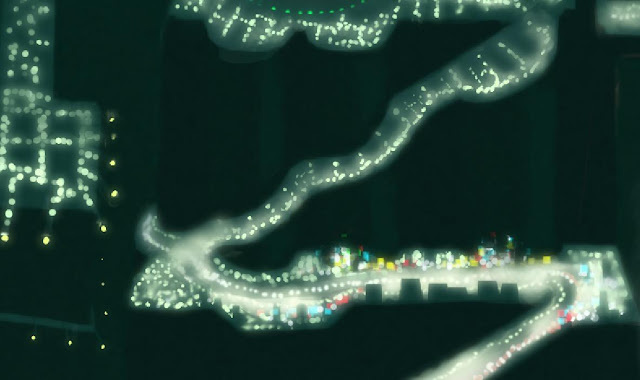 When you have placed all your lights, duplicate the light layer and name it "City lights glow". Run Filter->Blur->Gaussian blur at a strength of 10. Then put the layer to mode "Screen". You now know have a nice glow to your light. All that's left now is subtle tweaks on a new layer. Put small edges of white in some places, make details where you think you can get away with it. We're done! If you followed to here, good job! Hopefully this tutorial was useful to you, gave you some new ideas and/or trained your skills.